This week’s featured post is from Dina-Marie at Dimes2Vines. Did you know that Osteoporosis and Osteopenia are common side-effects of celiac disease? Dina-Marie shares her experience of using the GAPS diet to improve her Osteoporosis – after menopause. It’s fascinating how the right foods can help our bodies heal! This week, I’m sharing my favorite way to stay out of the coffee shops. Spiced Cranberry Apple Cider is one of my favorite GAPS-friendly drinks because it feels indulgent but is super easy to make. There are no extra steps that take up time, prep, or create a lot of dishes (coconut milk anyone?!). Best part, no added sweeteners needed! Thanks for featuring my post – what an honor! Today I shared Grain Free Pizza Crust and Cure Tooth Decay. What interesting information about bone loss! Thank you. This week I am sharing a raw strawberry “cheese” cake. I am pretty sure all ingredients are GAPS legal. But please let me know if not. Hey! Thanks for the personal invite! I just wrote a post about one of my favorite dishes, Salmon and Cauliflower Curry, which is GAPS legal and full of healing ingredients. I make mine own nightshade-free curry mix and provide a link to a recipe for those who want to make their own. Happy Friday! This week I’m sharing my recipe for Nirvana Pasta. Thank you so much for hosting! I added my article about Probiotic Pills vs Fermented Foods. I thought it would fit with a GAPS theme. Thanks for inviting me to share why grassfed meat is important to health. Here is the very first blog on my website, which goes into detail about the health benefits of grassfed meat. The Weston A. Price diet began to restore my health, but I still needed grassfed meat to give me strength. The combination of a WAPF diet and grassfed meat have been so important to my health and the health of my family! I shared two GAPS-friendly posts and they’re related. One is a primer on baking with almond flour and the other a primer on baking with coconut flour. i’m sharing pemmican, or what my kiddos call “mommy’s meat muffins.” i hope raw dehydrated meat is GAPS legal. maybe not in the intro, but later on? This is GAPS legal and looks amazing, but yes, for the Full diet. Thanks for sharing, Rebecca! Thanks for inviting me to share Mama! I added my Lavender and Berry Terrine – an elegant sounding, but homey gelatin dish! p.s. Your talk at the GF Food Fair sounds amazing – I’ll be there and will try to make it to listen – thanks for everything you do! Thank you so much for the Personal Invite!!! Glad to share one of my GAPS/SCD friendly recipes today I shall be sharing my Recipe for: JoAnna’s Rocki’n Kimchi -Kid Approved! Its kinda a mixture of Korean and non-traditional, using Sea Salt instead of Vinegar, I have posted allot of variations too so make it to suit your taste buds, But above all MAKE IT!!!!! 🙂 its soo good and I everyday staple in our home! You can get your link to show with a picture in the collection above by clicking on the blue button that says “Add Your Link” then typing in the information for it. The tricky thing is that the “Name” field is for the name of the post, not your name! Oh thank u!! I HAD no idea!! 😀 done thank u for taking the time to show me! Thanks for hosting! 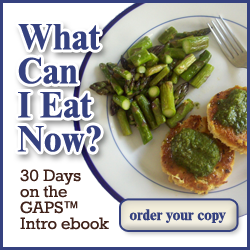 This week I’m sharing my 5-minute explanation of what the GAPS diet is and why you might want to give it a try. Hi – I shared two recipes, the first one I messed up and named it Divine Health, but it’s Kefir Leather! The second is the best chicken liver pate I’ve ever tried (and I’ve tried it many times)! Thanks for inviting me and hosting!